Diane McFarlin, B.S. Journalism 1976, is dean of the University of Florida College of Journalism and Communications. She began her journalism career in high school and took a reporting job in Sarasota after earning her degree at UF. McFarlin rose through the ranks to become managing editor of the Sarasota (FL) Herald-Tribune at 30. She was named executive editor of The Gainesville Sun three years later and then returned to the Herald-Tribune, serving as executive editor for a decade and publisher for 13 years. Under her leadership, the Herald-Tribune Media Group, the largest media company in Southwest Florida, was touted as an industry leader in media convergence and digital innovation. She became dean of the College in January 2013. Since arriving here, she has developed a strategic framework for the College, expanded interdisciplinary initiatives, established a central hub for professional advising and student services, increased research productivity through top faculty hires and increased funding, and launched The Agency, a strategic communication agency led by professionals and run by students. 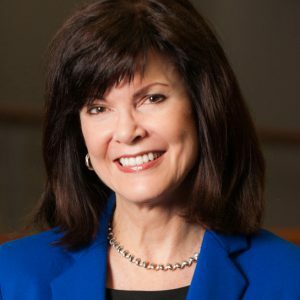 In March 2019, she was named the Scripps Howard Awards College Administrator of the Year. McFarlin is active in state and national media organizations. She is a past president of the American Society of News Editors and has served six times as a juror for the Pulitzer Prizes. She has taught at the Centers for Independent Journalism in Prague and Bucharest, and addressed the World Editor’s Forum on the subject of multimedia newsrooms. McFarlin has worked on behalf of numerous nonprofit organizations and launched the Season of Sharing charitable fund, which has raised $20 million to provide crisis funding to families on the brink of homelessness.